You are browsing the archive for Brazil. We started with a brief introduction from each participant to allow everyone to know each other. This showed how diverse of a group we were: engineers, developers, business consultants, designers, social assistants, teachers, journalists, students and researchers. Some of the participants had collaborated with the Brazilian Freedom of Information Act (FOIA – 12.527/2012), so we had a small discussion about how this law was produced, its purposes and limitations. There was also a brief presentation about what is open data, focusing on the eight principles: Complete, Primary, Timely, Accessible, Machine processable, Non-discriminatory, and License-free. These facts show an existing sexual division of labour segments – if this happened only due to vacation, it would not be a problem. However, this sexual division of work reveals that some areas impose barriers and prevent women’s entrance, although, these areas often provide better pay than those with a female majority. Graphs were generated in Infogr.am and the data used for the graphs is available here. I had the opportunity to talk about the way the Guatemalan government hid the deaths of kids who died, due to malnutrition, by analysing a database of death records of the country. To me, it was an important lesson to learn. Data literacy practitioners who work in more difficult contexts, with less access to the latest technology and with more challenges in obtaining data that supports stories, can still produce relevant, impactful work. This post is authored by Vitor Batista, who works as developer for the Open Knowledge Foundation, and Neil Ashton, Data Roundup Editor for the School of Data blog. It is cross-posted from the PBS Ideas and OpenSpending blogs. Brazilian NGO INESC (Institute of Socio-Economic Studies) and Open Knowledge Foundation Brasil want Brazilians to participate in the allocation of their public spending and ensure that it is used to construct a free, fair, and sustainable society. That’s why we partnered to create Orçamento ao seu Alcance, a site which presents the execution of the Brazilian federal budget in an interactive and intuitive form. We used OpenSpending as our database. This made it easier to focus and develop our visualizations without the need for setting up additional infrastructure for data hosting, and it made the data readily available in an accessible way. Millions of Brazilians pay the taxes that fund the federal budget, but few actually understand it. Most are unaware of Brazil’s unjust regressive tax regime and of the scale of the losses to the public through misallocation. The information they need to understand these realities is simply not available in a comprehensible form. By building Orçamento ao seu Alcance, we hope to change that. Orçamento ao seu Alcance’s development focused particularly on the issue of underspending. 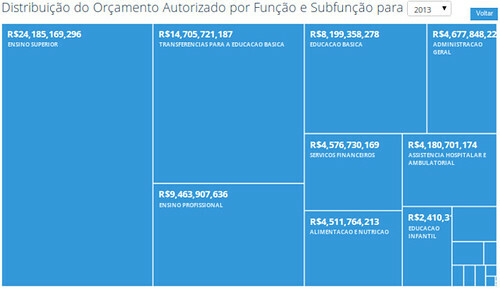 All Brazilian public bodies spend less money than is allocated to them, to varying degrees. The Ministry of Education, for example, left 16.3% of its budget (about US$ 6.1 billion) unspent in 2012, and the Ministry of Culture only spent 47.5% of its budget in 2012. If Brazilians’ needs were really being met – if every Brazilian who wanted to study had access to good public schools, for example – this underspending would not be a problem. But that is far from the case; in fact less than 1% of schools have an ideal infrastructure (a problem we have explored previously). To explore and highlight the problem, and we created a special-purpose data visualization. For the index page, we wanted to show a broad view of the budget across all public bodies. More than that, we wanted to show the amount of money used in each function and subfunction (e.g. Education and Basic Education). To do this, we used the OpenSpending treemap visualization. OpenSpending allows you to create a treemap as a “widget” which can be simply dropped into a site. We used a modified version of the widget code with customized colours and a “back” button for improved navigation. To help the user find public bodies, we implemented a search box with auto-complete using Twitter Bootstrap‘s typeahead library. To make the search instantaneous for the user, we load all data entries as soon as the user enters the page. The OpenSpending Aggregate API once again helped with this, allowing us to get a list of all public bodies with a simple query. We did run into a few problems using OpenSpending to build the site, though all of them could be overcome. The Aggregate API only allows you to request one financial quantity (one measure) at a time. You can’t request both a budget quantity and a payment at the same time, for example. Our underspending graph ended up using three measures, requiring three requests. This is a performance problem. Because the API caches results, however, it ends up being OK – and there are already plans to support multiple measures in future versions, so this problem will soon be solved. With the treemap visualization, our problem was that widgets are not customizable. They’re made to be dragged and dropped into a blog post or a newspaper article, not integrated into a site with its own design. To change the treemap’s colours and fonts, we had to use a modified version of the widget’s code. We’re happy with how Orçamento ao seu Alcance turned out, and OpenSpending contributed a lot to its success. For developers, OpenSpending made it possible to run the site without its own database and to publish its content in a sleek, cacheable form. For the project’s NGO supporters, using OpenSpending makes it possible to update the data without needing to deal with the site’s developers. Everyone is happy. We hope that Orçamento ao seu Alcance will inspire other OpenSpending satellite sites that will help spread budgetary awareness around the globe. ChequeURL: it plays along the very idea of URL shorteners, and when the user pastes a URL of a news story, it automatically searches for names of companies. We are using a database of the 700 most important companies in Brazil. 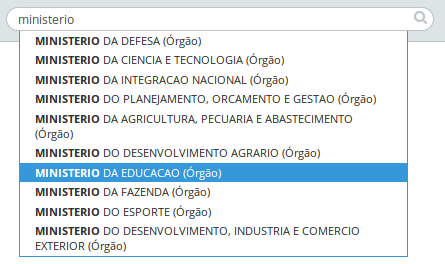 What this hack does is to compare the names of these companies and display their relationship with the Brazilian government, side by side with previous donations to candidates in 2010 elections. Otoridades: a simple platform (using WordPress!) that gives the citizen the ability to send reports of abuses of power. Everyone is invited to contribute. With it we plan to give a tool for Brazilians to voice-out their demands and stories of corruption and report of “authorities” who have used their influence in a negative way or to acquire personal benefits. Mapping of Legislative Process: we’ve been working collectively in the mapping of the legislative process. We want to make sure people understand how laws are made in the Congress; what the proceedings are and steps to pass a bill, and what the tricks and tips are that only our representatives are familiar with until now. The lessons learned in CONSEGI include the notion that there is still much work to do in the open data scenario in Brazil, but there is will in some parts of the government to bring a culture of openness to the Leviathan. But indeed, the bonus point of our trip to CONSEGI was the ability to put names to faces and interact with other people from the international open data community. 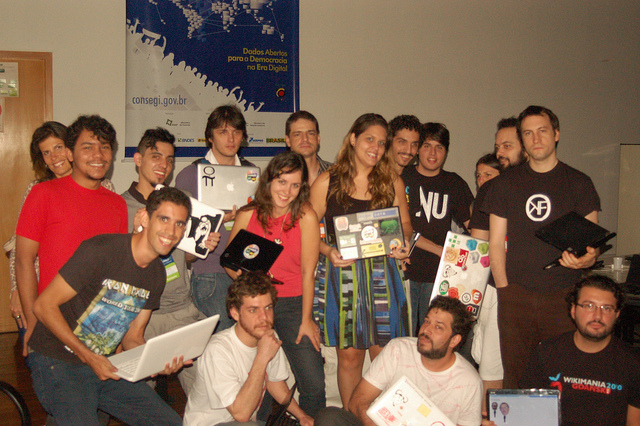 We are very excited with what we are building here in Brazil, and the growth of our vibrant group of hackers is quite stunning. From now on, we would like to share best practices and learn from others, engaging Brazilians in a global conversation on the use of information for social good, and help riddling the puzzles and challenges that come to our hands, just for the sake of hacking stuff. Any ideas?